The sun’s output in the visible spectrum peaks around yellow. Our eyes are most sensitive to that part of the visible spectrum. The sun also radiates in a broad range of other wavelengths invisible to our eyes. Each comes from dynamics taking place on the surface and in the atmosphere of the sun. I’ve written about NASA’s Solar Dynamics Observatory (SDO) earlier in a previous post. 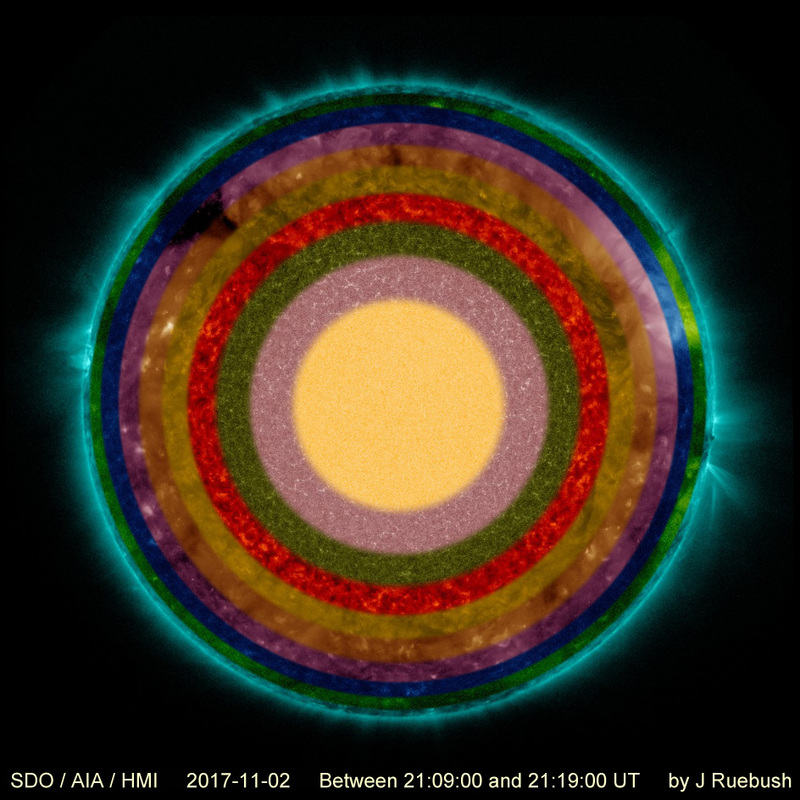 SDO observes and images the sun several times a minute at ten different wavelengths to give a more complete picture of the activity at and near the surface. A description of those wavelengths is available here. I used the images from the SDO site to render this image of the sun at those ten wavelengths. The yellow center represents the sun’s surface. Each ring of color is at a higher altitude and temperature in the atmosphere of the sun. The JUNO spacecraft continues its mission of very close flybys of the cloud tops of Jupiter. The most recent pass was on 19 May 2017. Images downloaded from the JunoCam instrument were made available to the public. I downloaded two sets in red, green, and blue filtered grayscale. Each set was combined into color versions using Photoshop and techniques described in a previous post. The colors are my interpretation and not necessarily real. I’ve created color composites from three grayscale images using the technique in this post. The colors assigned are not necessarily what the human eye would see, but are used to bring out details. Unless otherwise noted, all images used three original grayscales from the Hubble Legacy Archive. Visit the gallery of previous Astro-Images. 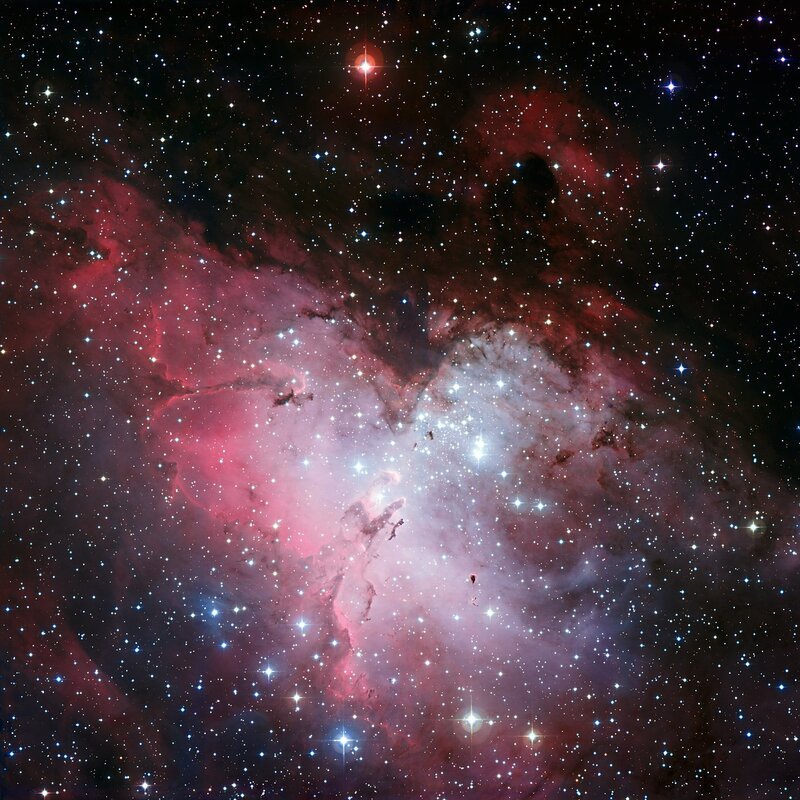 The Eagle Nebula is about 7000 lt yrs distant in the constellation Serpens of the southern skies. The cluster of bright stars at the core was discovered by Jean-Philippe de Chéseaux in 1745-46. Images today show much more detail than Chéseaux was able to see. This image made from 3 greyscale components by the European Southern Observatory in 2009 shows those details. The very bright open cluster of stars barely right of center causes gases to glow and silhouettes of the dust regions. Those bright young stars formed 1-2 million yrs ago. The Saturn Nebula is in the constellation Aquarius. William Herschel found it 7 Sep 1782 using a telescope in his garden. The image he saw had a central bulge with narrow extensions on either side that made it look a bit like Saturn. Images today show more detail and make it look less like Saturn. The hot central star is emitting jets of debris to the upper left and lower right. I enjoy creating color images from three grayscale images. 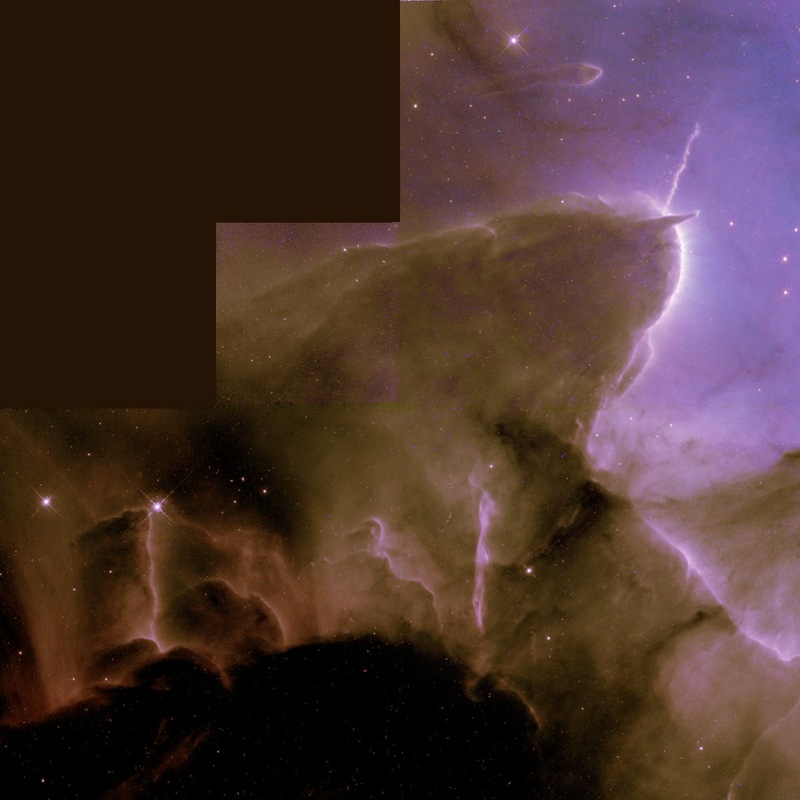 The post linked here will explain how to create color astronomical images. The colors assigned are not necessarily what the human eye would see, but are used to bring out details. 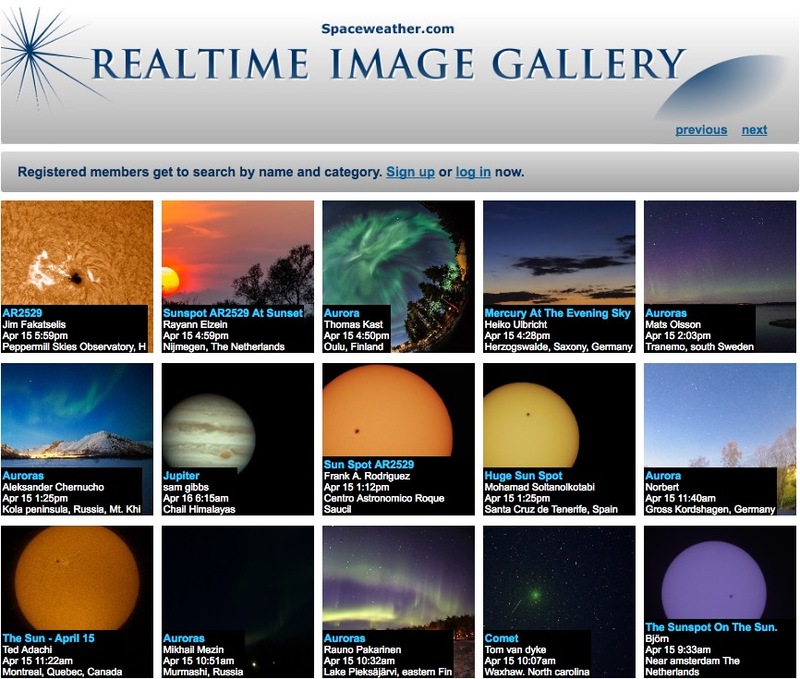 Visit the gallery of previous Astro-Images. Unless otherwise noted, all images are made by me using three original grayscales from the Hubble Legacy Archive. Can an exploding star create debris in the shape of a rectangular box? It appears that is what happened with the Red Rectangle nebula. It is found in the constellation Monoceros which is just to the left of Orion. The nebula was discovered in 1973 when scientists were using a rocket to search for infrared sources. The two stars at the center of the nebula were discovered in 1915. Consider this model of the Red Rectangle. To make it, I put an image of a wine glass stem-to-stem with another and placed them horizontal. Two stars are in orbit where the stems join. One of the stars is nearing the end of its life cycle and is emitting large amounts of gases in two directions (left and right) along the axis of spin. The excited gases appear red. This model is not viewed exactly 90˚ to the axis. The actual image above is actually 90˚ to the axis of spin. In the image above, there are variations in the cones emitted to the left and right. They are disruptions to the flow of gases from the source star caused by the other star in orbit around the source. It rises like a two-horned monster out of the dark clouds below. Instead, it is a lobe of dust and gas illuminated and eroded by intensely powerful stars out of the field of view to the right. Part of the Trifid Nebula, discovered in 1764 by Charles Messier, this lobe is a star forming region. The ‘horns’ and ‘tadpole’ appearances are due to the presence of very dense clumps of dust and gas at the tips which are more slowly blown to the left by the strong stellar winds. The three-lobed Trifid is in Sagittarius. This Hubble image is only a small part of the entire nebula. This is another example of a dying Sun-like star. Each one results in a unique shape and color. The star that made this nebula is in the center. The nebula is located 6500 light years away in the constellation Hercules in the northern skies.